Teak is the prominent tree species in the forest and there are a few lakes, which makes sure the park has rich water resources. 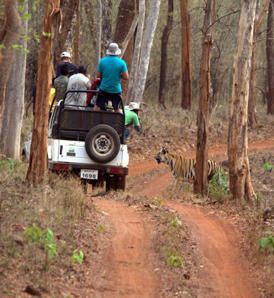 Major part of this forest lies in the hilly area, thus many hillocks and terrains provide shelter to the wild animals here. 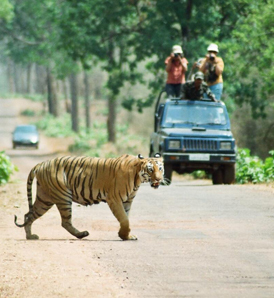 The Tadoba National Park is divided into three separate forest ranges, i.e. 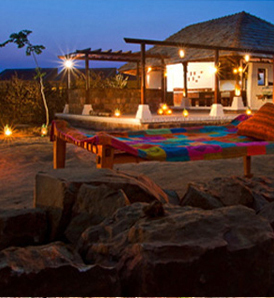 Tadoba north range, Kolsa south range, and Morhurli range, which is sandwiched in between the first two. There are two lakes and one river in the park, which gets filled every monsoon, the ‘Tadoba Lake,’ ‘Kolsa Lake,’ and ‘Tadoba River.’ These lakes and rivers provide vital ingredients needed to sustain the park’s life. 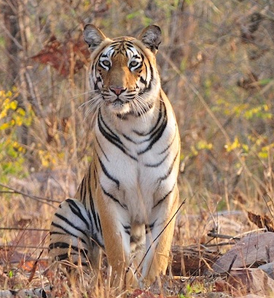 The Tadoba Tiger Reserve is rich in flora and fauna. Some of the famous and wildly seen flora of this park include, Teak, Ain, Bija, Dhauda, Hald, Salai, Semal, Tendu, Beheda, Hirda, Karaya gum, Mahua Madhuca, Arjun, Bamboo, Bheria, Black Plum, and many others. Apart from this the list of animals noted in this part include, Tigers, Indian leopards, Sloth bears, Gaur, Nilgai, Dhole, Striped Hyena, Small Indian Civet, Jungle Cats, Sambar, Spotted Deer, Barking Deer, Chital, Marsh Crocodile, Indian Python, Indian Cobra, Grey-headed Fish Eagle, Crested Serpent Eagle, Peacock, Jewel Beetles, Wolf Spiders, etc.